I’m obsessed with shrimp and this is one of the dishes I make often in the Instant Pot. Throw in all the ingredients and pressure cook for 3 minutes followed by a quick pressure release; delicious shrimp curry will be ready and made effortlessly. 5 minutes to saute all the ingredients, 5 minutes for the pressure to build, 3 minutes for pressure cooking and 2 minutes for the final cooking- that’s 15 minutes in total, while pressure building we are not doing anything IP will take care of that. 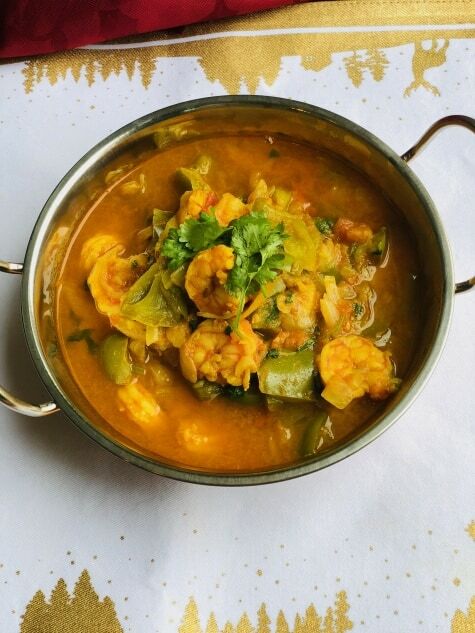 This shrimp curry can be served with basmati rice, white rice, roti, chapati, appam, idiyappam, orotti etc. Turn on Saute Mode- Medium Temperature. Let Hot sign display on the screen. Add oil and cumin seeds, saute for 3 seconds. Add chopped onion, season with ½ tsp salt. Add tomatoes, saute for a minute. Add chili powder, turmeric powder, cumin powder, coriander powder and ½ tsp more salt, Combine well. Add Garam Masala if you prefer. Close the IP with its lid. Ensure the whistle is kept tight and in place, just push it down. Select pressure mode: High pressure and set time to 3 minutes. After pressure cooking, do a quick pressure release. Open the lid, combine well. Add chopped cilantro, combine well. Taste and if required add more salt and chili powder if you want the curry to be spicy. Serve into a bowl, serve with rice, roti, chapati, appam etc. 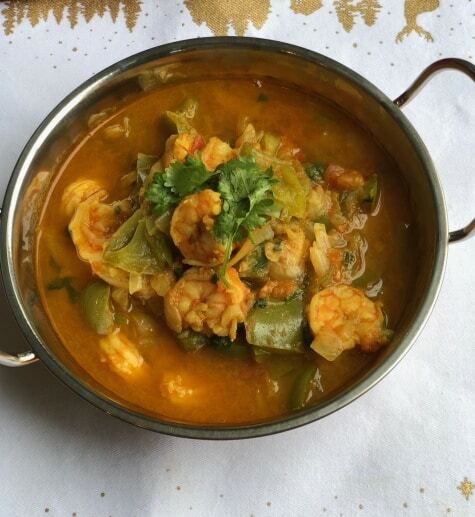 To make Shrimp Korma: after pressure cooking, you could add ½ cup coconut milk and cook for 2 minutes in saute mode.